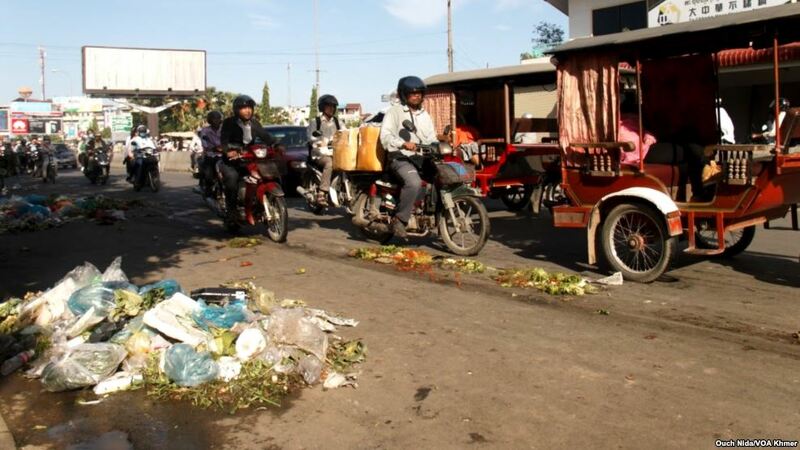 It’s heart breaking how trash is gradually taking over Cambodia. They’re everywhere, and when I say everywhere, I mean they meet your eyes in almost every direction you look. Plastic bottles, cans, and packages lie scattered and neglected on the streets and bodies of water. Piles of garbage sit at street corners, edges of markets, and even in the sewage. There’s no denying that littering is a serious problem in our country, and it’s time we start doing something about it. Let me take you through two journeys of consequences if you litter. That way, both you and I can stay entertained. Win-win. Ready? Okay, imagine this: You just finish a can of coke. Ahh, refreshing. Without a second thought, you throw the can onto the busy street, even when you see a trash can on the other side of the street. It’s been a few hours and no one’s picked it up. During that time, people tripped on it and some even swore because you ruined the sole of their branded shoes. But then, a guy throws a bottle onto the ground because he sees your can . Other people start doing the same. Two, three.. Until almost everyone starts to litter. Now, let’s say that the trash collector rarely comes to this city section. Next thing you know, the street where you threw your can becomes a stream of garbage. The stink is suffocating. Walking through the area, you can come across sharp objects, leading to Tetanus infection. In a tropical country like Cambodia, there are so many germ-carrying pests such as flies, cockroaches and rats that would hang out in those trashy piles. They could carry those germs to your house, even if you live far away. Just like an unwanted free delivery. A fly flutters in and lands on your just-cooked soup, Salor Machu. Without noticing, you eat the Salor Machu anyways. The next day, you head to the hospital because you got diarrhea. The doctor says that you havefood poisoning and gives you a prescription. Meanwhile, the same thing happens to the daughter of a poorer family, but they can’t afford the hospital bills. The disease worsens, until she breaths her last breath. Checklist of consequences from littering: Unattractive landscape, check. Bad odor, check. Disease, check. Pressure on poorer families, check. With the heat of the Sun, the plastic gradually releases chemicals into the water. The longer the plastic stays in the ocean, the more bioaccumulation (which means that the chemicals would be concentrated in the body of the creature that consumes the plastic, spreading the chemicals to its predators as well) and killing of fish. Guess what? That might lead to the end of seafood. The litter will become more visible to the tourists, making them consider not to come to the place anymore. Littering consequences fill-in-the-blanks: Body of water, poisoned. Sea creatures, dead. Tourism rate, dropped. Keeping some of these long-term effects in mind, why risk it? As of 2013, Phnom Penh produced about 1,286 tons of solid waste per day, but by 2030, it is estimated to more than double to 3,112 tons per day. Our government has enough trash to worry about. Imagine how much more work, time, and money are needed to gather all the trash lying on the ground. If you’re depending on street cleaners to clean after your carelessness, don’t. About 2 years ago, sanitation workers under garbage collector company, Cintri, strongly demanded for higher salary. Why not make their job less of a burden by giving them one less task to do? Little things you can do: Set a good example by always making an effort to find the nearest trash can or simply keep the litter until you find one. Join ‘clean up’ events to pick up litter and raise awareness. Try reusing and recycling items. No idea how? Come on, it’s the 21st century; information is EVERYWHERE. And if you do these things, you save yourself AND the environment. Sounds like a pretty good deal to me. LITTERING COSTS. THINK TWICE BEFORE LITTERING. You are absolutely right, people should really start shaking theyre brain and get on with it and clean the country for once, and also putting littering fees etc etc meaning more serious Police mans, but most are here for corruption, its hard. From the quality of writing to quality of idea, I mean this is amazing. I know we are good at skimming a text, but this one will make you go back to the beginning of the text and start reading between the lines, not because it is difficult to understand but how fun and amazed the ideas are!